Geraldine Plunkett was a daughter of Count George Noble Plunkett and a sister of Joseph Mary Plunkett. She became Joe’s aide-de-camp and knew all the 1916 leaders. She and Joe lived in Larkfield cottage in Kimmage where they stored guns and ammunition, and a lot of drilling, etc, occurred. Joe brought in Michael Collins to help her with the family accounts. She attended UCD and fell in love with her chemistry lecturer, Tom Dillon. 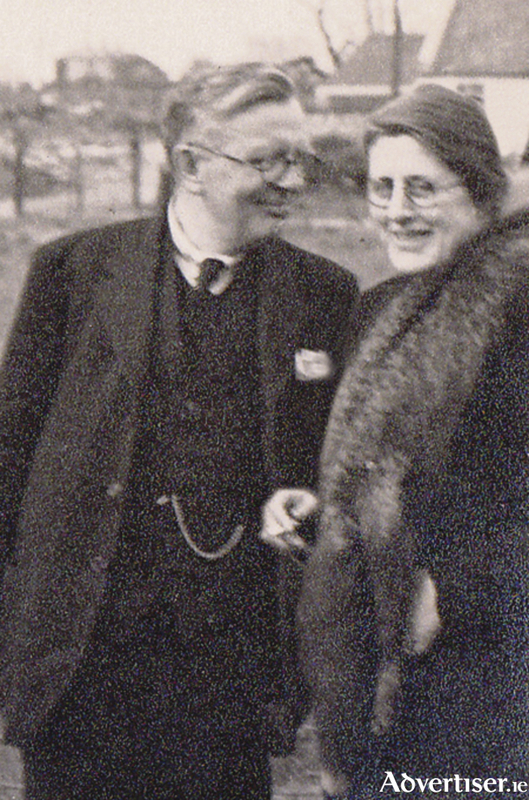 They were to be married on Easter Sunday 1916 in a double ceremony with her brother Joe and Grace Gifford. Joe was prevented from marrying, so Ger and Tom were married in Rathmines and stayed in the Imperial Hotel, O’Connell Street, to be available for action if needed. They watched the beginning of the Rising from their hotel window. Tom was arrested in the round up after the Rising. Geraldine’s two brothers, Jack and George, were sentenced to death, later commuted to life, and her parents were also arrested. In 1918 Tom was secretary of Sinn Fein. In 1919 he was just released from Gloucester Prison when he was appointed professor of chemistry in UCG. It was here Ger was sworn into the IRB. They bought a house (co-incidentally from Tom Dillon ) on College Road. Republican Courts were held in the house, the first of about 15 houses they lived in in Galway as they were constantly on the run, and being raided by the RIC and the Black and Tans. After the shooting of Seamus Quirke and Sean Mulvoy, Galway solicitor Louis O’Dea decided to hold a public enquiry into the shooting of civilians by members of the armed forces. Notice of this enquiry was posted on walls around the city, and a copy sent to each of the RIC inspectors. The enquiry was to be held in the Town Hall and those appointed to hold it were Fr Considine; John Conway, solicitor; Prof Tom Dillon; and Tom Ray, ex-RIC. The Town Hall was surrounded and Inspector Cruise ordered them to stop. They resisted and he called in the troops. Fr Considine pleaded with them to abandon the enquiry in case of loss of life and they did so. Padraic Ó Conaire, who was present, was heard to say, “Judgment has gone by default”. Tom organised the raid on the courthouse for important county council books in February. He contacted two students in UCG, Jack Darcy and Michael Dwyer, who, with Kilfeather and Martin Brennan, arranged with Seamus Carter, who was a clerk in the Courthouse, that these essential books should be in a certain place on a certain date. Carter walked out of the building a few minutes before they arrived. He walked past the sentry on guard at the Town Hall. The boys took the books, and put them into a car driven by Bill Garvey, who drove them out to the Castlegar men who took them over, thus severely damaging the county council administration. At one point, the Tans were banging on the door of their house in Montpellier Terrace. Geraldine engaged them in conversation from an upstairs window while Tom escaped out the back in his pyjamas with his trousers wrapped around his neck. As he climbed over garden walls he lost the trousers but made his way to St Mary’s College where they hid him. For some reason, the woman who found the trousers would not return them. Geraldine was constantly agitating against the army and RIC. She complained bitterly that nine trainloads of parcels of poultry were sent from the GPO at Christmas by the Black and Tans. She was caught with notes she had been compiling about the ill treatment being meted out by the RIC and the Tans. She was interned in Galway Gaol, but after questions were asked about her in the House of Commons, she was released. Tom became a leading teacher and researcher in the world of chemistry, he broke new ground in the uses of alginates and was a pioneer in the development of Irish universities. Ger was very involved in the setting up of An Taidhbhearc, the masks she had made in Dublin of Comedy and Tragedy were used as a kind of logo by them. She was a founder of the Galway Art Club and a regular exhibitor with it, and she was the treasurer of a committee set up to fund a memorial on O’Brien’s Bridge to those killed in Galway in 1916 and during the War of Independence.